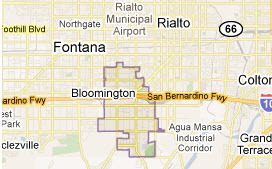 Bloomington - Service Areas - Services - Allied Commercial Real Estate, Inc.
Bloomington is an unincorporated census-designated place (CDP) in San Bernardino County, California, United States. The population was 23,851 at the 2010 census, up from 19,318 at the 2000 census.Though now unincorporated, many of the town's political activists are pushing for Bloomington to attain cityhood, while the nearby cities of Rialto and Fontana are attempting to annex the community. The incorporation effort is led by the BIC, the Bloomington Incorporation Committee. The 2010 United States Census reported that Bloomington had a population of 23,851. The racial makeup of Bloomington was 12,988 (54.5%) White, 649 (2.7%) African American, 309 (1.3%) Native American, 330 (1.4%) Asian, 47 (0.2%) Pacific Islander, 8,600 (36.1%) from other races, and 928 (3.9%) from two or more races. Hispanic or Latino of any race were 19,326 persons (81.0%). In the CDP the population was spread out with 36.4% under the age of 18, 10.5% from 18 to 24, 29.5% from 25 to 44, 16.1% from 45 to 64, and 7.5% who were 65 years of age or older. The median age was 27 years. For every 100 females there were 100.2 males. For every 100 females age 18 and over, there were 97.7 males.